Guccio Gucci started his luxury leather goods brand in 1920 after working at a hotel in London and noticing the high-quality bags of the well-to-do customers. Essentially, he experienced the ultimate “I could do that” moment and set out to prove it. Today, Gucci is one of the world’s most popular and most valuable luxury lifestyle brands with a global footprint surpassing that of fellow Italian superbrands Armani and Versace. When Gucci does something they go all in and their line of men’s watches is ample evidence of their commitment to both style and quality. Below are the best 20 Gucci watches for men. Gucci designers strive for universal appeal with their G-Timeless Silver-Toned watch and manage to strike just the right balance between the classic and modern, the fashionable and functional and the male and female. This is unisex design at its best with the feminine aspects shining through in the smaller variants and the masculine features coming to the fore as the watch ramps up in size. Waterproof down to 165 ft this is no gilded lily, but will serve you equally well whether you’re checking the time as you take your seat at the Met or the sloop is slicing through the surf off Montauk. 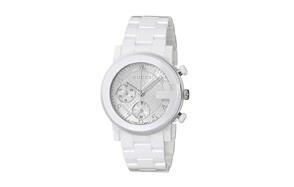 Stunning design, unequaled comfort, and unparalleled versatility make it our choice for best Gucci watch for men. 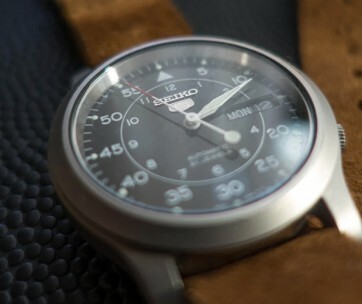 For more great products like this, check out our guide to the best Seiko watches. Water resistant to 165 ft (50 meters). The masculine appeal of this Gucci G-Timeless Analog ETA timepiece is unmistakable yet not so overt that it tips over into parody. Instead, it employs tasteful lines, sumptuous materials and subtle coloring that produce a restrained yet forceful presence and one that is certain to generate compliments by the boatload. The Swiss quartz movement, superior craftsmanship, and rugged appeal make it the perfect stylish gift for the outdoor guy on your shopping list. With a fixed yellow gold PVD bezel and red and green nylon weave dial background, it hits all the style marks. Sleek, elegant, tasteful and yes, timeless, the G-Timeless Black Dial men’s Gucci watch is the ultimate statement of arrival. Classic lines are interwoven with a restrained color palette to create the visual balance that speaks to the wearer’s taste as well as to their sense of self and their place in the world. Waterproof down to 100 ft (30 meters) the Black Dial Gucci Timeless Watch won’t succumb to the occasional dunking. Comfortable, with a moderate weight that’s authoritative without being burdensome, this waterproof watch is a fashion statement and lifestyle companion that will serve you equally well in the boardroom or on the beach in Forte dei Marmi. Classic stainless steel and black. 38mm case with 8-inch bracelet. Classic European design influences are brought to bear on this Gucci Stainless Steel sports watch which manages to wear it’s preference for the outdoors on its sleeve without excluding it from the office, the gallery or the 5-star restaurant. With so many sports watches embracing an absurd, almost comic-like bulkiness Gucci designers bring matters back to earth. This is a genuinely useful and tasteful timepiece for outdoor lovers that’s as rugged as it is handsome, stylish as it is functional and dependable and it is fun. Water resistant down to 330 ft (100 meters) with luminescent hands and a 23 mm band it’s must-have gear for trail or beach. Silver-toned luminous hands and markers. For those who like to live a bit more on the fashion edge, Gucci presents their Interlocking Iconic Bezel Anthracite Men’s Watch. Gunmetal grey and ready for the club, the cabana or a night out in Ibiza this men’s watch is unapologetically bold and unmistakably Gucci. Like most Gucci watches on this list, it’s water resistant to 165 ft which makes it an outdoor lover’s dream. It also features a durable nylon and leather strap and scratch resistant sapphire crystal face. The interlocking G icons are a streetwise 21st-century design touch that Gucci pulls off with casual aplomb. And the fact that it’s available in 29, 37 and 42 mm diameters means there’s one for every sized guy. Analog display with precise Swiss quartz movement. Bold and timely but never merely trendy. The genuine leather band with fabric inlays. A companion piece to their Analog ETA Quartz Brown Leather Watch the Gucci Gold and Nylon Watch is aimed more directly at the outdoorsman. Its durable waterproof nylon strap will withstand repeated dunkings without blinking. The case itself will repel water down to 165 ft and the 38mm diameter is bold enough to be easily read in any conditions but not so big that it calls attention to itself in a silly way like so many sports watches. The bee motif is woven into the case back, underpinning gold-toned hands that move with Swiss quartz precision month after month, year after year. If you love the analog ETA Brown Leather Gucci wrist watch but want something more overtly outdoorsy, here it is. 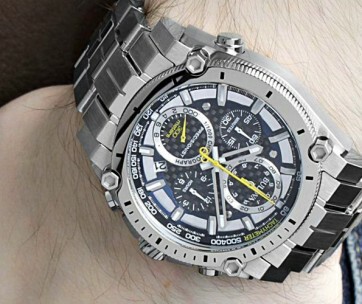 Be sure to also check out our guide to the best Bulova watches for more great products like this. Ideal for sailing, surfing, canoeing. Green, red and gold color scheme. Classic front pocket watch design cues meet clean, digital age coloring in the G-Chrono Men’s White Watch from Gucci. You’re not going to wear this to a job interview or board meeting but you will find yourself reaching for it as part of your everyday kit more than you imagine. While it undoubtedly looks like it came from the set of a sci-fi film it’s actually a Gucci chronograph watch with retro appeal and space-age reliability. It would be tempting to say Gucci was poking fun at the sports watch with their G-Chrono White watch, but in reality, it’s more like their redefining the terms. Our Premium Choice. White ceramic bracelet with firm buckle closure. The G-Timeless line of watches from Gucci aspire to a higher level of civility. They embrace the vitality of modern life without forgetting their roots in the Swiss watchmaking tradition. There are scores of different variants on the Gucci G watch theme but perhaps none more satisfying than the Analog Silver Mens Gucci Watch. With its urban overtones and traditional foundations, it strikes a perfect balance between the functional and the stylish. And with its flawless chronograph functionality, it demonstrates that it’s more than just a pretty face. 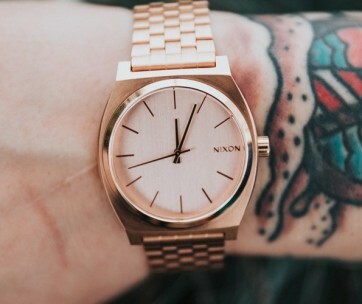 Don’t forget to also check out our reviews of the best Nixon watches. 45 mm case with sapphire crystal. Oversized markers balance the lines of the band. Chronograph displays 60 seconds, 30 minute and 12 hours intervals. Won’t shy away from a good soaking. There are beach watches and then there are dive watches. And they are not the same thing. The Gucci Stainless Steel and Nylon Dive Watch is a perfect expression of what a can be achieved when performance and style considerations are given equal weight and left in the hands of world-class designers to sort out. The Gucci Stainless Steel and Nylon Dive Watch is the ultimate timepiece for the man who feels the pull of the surf. A true underwater watch for the style conscious. Water resistant down to 660 ft (200 meters). Blue and red striped nylon bracelet. Traditional dive watch design overtones with Italian style. Take a walk on the wild side with Gucci Real, an all-black watch for men. To infuse their ultimate urban timepiece with proper street cred Gucci brought in Trouble Andrew, a Brooklyn based graffiti artist and musician who applied his own unique vision of life on the edge to this rubber banded, all-black, tough as nails piece of pop culture kit. The theme here is keeping it real and that means acknowledging that the edge has its own center and that style is a much a state of mind as it is a product of the runway. Gucci watches have never been so funky. Stainless steel case with sapphire crystal. Whether you’re chairing an important meeting or riding with the top down along highway 1 in Malibu you want to look your best and there’s no better way to set the style tone than with the Analog Black Men’s Watch from Gucci. The design hits all the right beats with its combination of retro overtones and 21st-century graphics edginess in the face. The genuine calfskin leather band is comfortable and beautifully stitched, the face is clean and clear with luminescent markers and hands while the Swiss quartz movement is reliable as the sunrise. A great gift for the manly man. Analog display with Swiss quartz heart. Genuine full-grain calfskin leather band. Oversized hour markers for easy readability. Take the Analog Black Mens Gucci Watch and apply graphic flourishes in the face and band with quasi-baroque overtones and you get Leather Casual Watch, a men’s watch straight out of Tuscany. If you like your style to have a decidedly Italian late renaissance feel to it this is the timepiece for you. The sense of luxury is palpable. And as with all Gucci lifestyle products, the fusion of various influences is handled with a deft touch that generates a deeps sense of satisfaction. Water resistant down to 165 ft (not that you’re going to wear this swimming mind you) and powered by effortless Swiss quartz precision it’s far more timepiece than watch. Our guide to the best Fossil watches features more great items like this, so be sure to check it out. 38mm diameter stainless steel case. Markerless display with embossed background. Sometimes you’ll want your look to exude a timeless quality. And other times you’ll want to plant your feet firmly in the here and now. 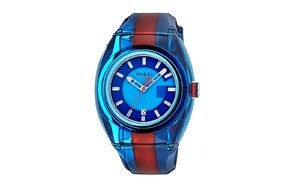 For those times there’s the Gucci Stainless Steel and Rubber Men’s Watch. The Steel and Rubber Men’s Watch makes optimal use of contemporary materials and design trends to produce a look and feel that is sleek as the digital age and rugged as your pioneering, forward-looking spirit. Translucent and transcendent with a blood red second hand to complement the charcoal overtones it’s contemporary attitude with smoothed edges. For more stylish timepieces, check out our guide to the best rose-gold watches. Uncluttered face with date indicator. This men’s gold Gucci watch looks like it belongs in the window of a watchmaker’s shop on the Ponte Vecchio. It sports a luxurious gold-toned case with scratch-resistant sapphire crystal guarding a green and red woven background with the snake motif. In some ways this is the quintessential Gucci wrist watch, evoking the brand’s signature eclectic romanticism and embracing the handicrafts that inspired founder Guccio Gucci. Swiss precision meets Italian design facility in the Gold and Leather Casual Men’s Watch. Be sure to also check out our top picks of green dial watches for more amazing products like this. 19mm genuine calfskin leather band with the tang clasp. Green and red woven nylon face. The G-Timeless Leather Strap Watch is another example of the brand embracing their Italian roots. The Leather Strap Watch pays homage to the leather workers of central Tuscany who routinely produce some of the finest leather goods on planet earth along with the goldsmiths that make Italian jewelry so unique and compelling. The depth of the design sensibilities on display here make the Leather Strap Watch as much a keepsake as it is, or will surely become, an essential component of your everyday style. La dolce vita indeed. Be sure to combine it with some of the best Gucci sunglasses from our list. House of Gucci bee logo at 12 o’clock. With the G-Timeless Automatic Mens Gucci Watch, the company reaches for a more international design aesthetic and hits the bull’s eye. The Automatic is characterized by clean, crisp lines, tasteful modulation of the design components, a numberless face that’s nonetheless easy to read and a delightfully slender case with sapphire crystal front and back. This is a men’s watch with universal appeal that will stand up to the rain and cast a favorable light on the wearer wherever they go. Our guide to the best Michael Kors watches features more great products like this. High polished stainless steel case and band. Chrono subdial with date window at 3 o’clock. The transparent blue case of the Gucci Stainless Steel and Rubber Casual Watch expresses the ephemeral qualities of much contemporary design through the use of aggressively modern materials. Any tradition at work here is cloistered away in the heart of the watch where Swiss quartz precision and exacting design standards passed down through hundreds of years provide the beating heart. The exterior though is all modern attitude with luminescent silver-toned hands sliding across a two-toned electric blue face. The Best Value on our list of 20 Gucci watches for men. Don’t forget to also check out our reviews of the best Hamilton watches that features more great products like this. Luminescent hands and hour markers. 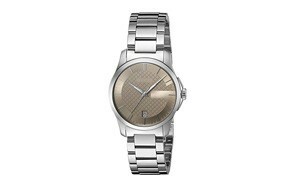 Elegance is the keyword with the Stainless Steel Dress Two-Toned Watch from Gucci. While you could, in theory, wear this swimming or sailing you’re going to want to reserve this luxury watch for special occasions. The pink gold and brushed stainless steel play off each other beautifully, creating a high level of visual harmony. The clean, measured tonal modulations in the face speak to a refined sensibility and the Swiss quartz movement ensures years of dependable, accurate service. Pink gold-toned bezel and bracelet accents. The gold-toned finish on the Dress Gold-Toned Mens Gucci Watch is applied using the physical vapor deposition (PVD) method of plating. PVD produces a finish that is highly decorative and extremely wear resistant. Which means you can rest assured that your men’s gold Gucci watch is not going to start wearing around the edges after a few weeks. This is an unabashedly dressy watch which, while highly water resistant, has no business showing up anywhere near a beach. The kaleidoscopic patterning on the face is as good a metaphor as there is for the hypnotic beauty of this luxurious gold watch. From the overt formality of the gold-toned men’s watch, we shift back to 21st-century attitude for the last watch on our list of the best 20 Gucci watches for men. This Stainless Steel and Rubber Men’s Watch is the 3rd variation of this Gucci stainless steel watch to find a place on our list and for good reason. There is plenty of design gold to be mined here. With this iteration, Gucci explores the less ostentatious side of contemporary style and the results speak for themselves. For more great products like this, check out our top picks of Citizen watches. Perfect for a day on the boat. As a young man, Guccio Gucci emigrated to Paris and then London where he worked as a porter in luxury hotels. Over time he became increasingly impressed with the high end, handcrafted luggage being employed by the wealthy travelers and decided he would try his hand at producing his own distinctive brand of leather goods. He returned to Florence overflowing with inspiration and drive and in 1920 opened his first leather goods store. Gucci was intent on retaining traditional fabrication methods and his efforts, along with the success of his brand, breathed new life into and shined a much-deserved spotlight on, the underappreciated crafts scene of early 20th century Tuscany. Today, the Gucci brand has a staggering valuation of more than $12 billion, with nearly $5 billion in sales in the US alone. But the company has never wavered from its commitment to high-quality craftsmanship, the finest materials, and both traditional and leading-edge designs. Gucci is the most valuable Italian luxury lifestyle brand today, overtaking Milanese rivals Armani and Versace. But they haven’t sat back and rested now that they’ve reached the mountaintop. Instead, they continue to push forward boldly into the future, surviving the departure of iconic designer Tom Ford to reinvent themselves as a 21st-century luxury lifestyle brand with a more accessible feel. Today, the company is owned by French lifestyle brand conglomerate Kering who have wisely chosen to take a mostly hands-off approach regarding the day to day management of their most valuable asset.